I'm having one of those moments where I wondering if it's possible to add one more thing to my plate! Here's a recap of a few of the things that have been going on. is PCS'ING TO CAMP ZAMA!!!!!!!! We could not be more excited about this! I have no idea how I'm going to survive the next 4-5 months until they arrive! We'll only have about 6-8 months together here but I'm sure we'll make the best of it! Our spouses association here on base had a basket auction to raise funds for scholarships that will be given to Seniors of Zama American High School. It was a 1920's theme and I had fun dressing up and we raised a TON of money! Speaking of fundraisers, I organized my 1st ever fundraiser as our unit's FRG leader. I've never been in charge of anything like this before so I was a tad stressed out but I has some great help. I'm sure things wouldn't have gone so smoothly without the awesome ladies who helped me! We raised over $700 and I'm so grateful to everyone for generously supporting our FRG. Hopefully this will be enough for us to put on an awesome climbing trip to Mt Fuji this summer! We found out that one of Jason's brothers is postponing his wedding. This is bittersweet for me. I'm bummed because we had already purchased Jason's $1800 ticket. We'll be able to use it for another trip but we're going to be out a pretty hefty change fee. I'm happy because I won't have to be away from home for 50+ days, I'll be here when my friends arrive and I'll be here for the big summer festival, Bon Odori. Thank God I noticed the broken prong before the diamond fell out! I'm wearing the ring my mom wore when she was married to my father until I can get mine fixed. I watched my Camp Zama BFF teach her last lesson to the wonderful Sagamihara Friendship ladies. This is also bittersweet for me. I'm so sad that she is leaving but I'm glad I'll get to see the ladies every week instead of just once a month. Although, this means I have to plan more lessons which is what I should be doing right now instead of blogging. Finally, I have to share my new favorite dessert with you. The recipe comes from a cookbook I purchased a few months ago called "Dinner with Warriors". 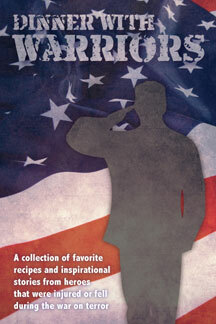 It's a collection of recipes from soldiers who were wounded or KIA during the war on terror. I made this Oreo Delight that was submitted by the wife of Tom Echols who was killed December 4th, 2006 at the very young age of 21. This dessert was so good and easy that I have made it 3 times in the last 10 days. I totally understand why it was a favorite of Tom's. It's my new go to dessert for put lucks! I purchased 2 of these cookbooks with the intent of giving one away and I'm finally getting around to that! If you'd like to win a copy of this cookbook all you have to do is leave a comment on this post saying so. This giveaway will end at midnight EST on 25March12. I will announce a winner the next day. Good Luck! Jess- I would LOVE a copy of the cookbook! I love cookbook's with meaning :) I have one from Fort Bragg and a few that my mom has passed down to me and I would love to add to my collection. Glad to hear about your friends joining you at CZ! I would love a copy! Not sure how to leave my contact info (you know, in case I win :) so I'll leave it in this comment. It's bethgravitz@hotmail.com. By the way, I really enjoy your blog. It's fun to see what life is like on an army base in a foreign country. So jealous of the life you're leading! first time commenter! Been reading for a few weeks! Would love a copy of the book! My wedding ring prong got all bent once, it was scary when I noticed! I would love a copy of the cookbook!!! I hope you can get your wedding ring fixed soon! I want it. That oreo goodness looks delish! That dessert looks good! Yum. Count me in for wanting to be included in the giveaway. I moved from Japan 3 months ago...and a couple of weeks before I left, I lost a sapphire at the train station, and a ruby from my wedding ring at a temple! It is so sad...but they are fixed now! So glad you didn't loose anything! I'd LOVE the cookbook! My husband and I lived in Okinawa for 3 years. We're in Germany now, but we miss Japan sooo much!